I contacted Luna a few months ago and recently was contacted back. I hear so much about them and see them all the time in the stores but I have been nervous about trying them. 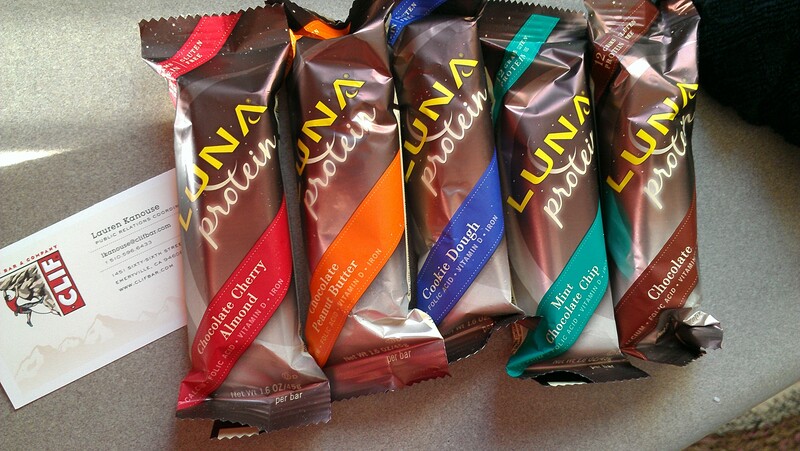 One thing that really sticks out about Luna is that it’s a protein bar for WOMEN! Please take a few minutes to take a look at Luna’s website and read about The Core Four. Luna states that “Vitamins and minerals are the nutrients that help your body thrive day in and day out. For women, a good rule of thumb is to think of Iron, Calcium, Folic Acid and Vitamin D as the “Core 4” vitamins and minerals important to maintain overall health. * According to reports by the National Institute of Health, women are challenged to eat sufficient amounts of these nutrients”. I received Chocolate, Mint Chocolate Chip, Cookie Dough, Chocolate Cherry Almond, and Chocolate Peanut Butter. One word: AMAZING! I honestly have no complaints about these bars! They are sweet, delicious, and they definitely satisfy my cravings when I have them. Most protein bars you will find turn out to be lacking flavor and just plain gross. NOT THESE! Luna Protein will be on my grocery list from now on for my go to craving killer and snacks. YOU HAVE GOT TO TRY THESE OUT! I had no idea they were for women! haha I’ve never tried one but you’re right, most protein bars a horrible! I might try them out!